Wayne Sandholtz is a Professor of Political Science at the University of California, Irvine. He’s the author of European Integration and Supranational Governance and co-edited The Institutionalization of Europe with Alec Stone Sweet and Neil Fligstein. 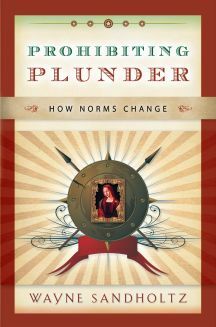 In his most recent book Prohibiting Plunder: How Norms Change, Sandholtz chronicles the history of war plunder and how norms and regulations have changed through the ages. The book examines events from before 1800 to the recent case of the Iraqi National Museum, tracing how current anti-plundering norms came to be. In the following excerpt, Sandholtz recounts the relevance of art plunder in Napoleonic France. Seizing the art of conquered territories for the Musée Napoléon was of great importance to Bonaparte, who even appointed art specialists to go with his army to the territories—a title that was part curator, part pillager. Napoleon began his illustrious career in art plunder as general of the French forces in Italy. Both the general and the Directoire in Paris assigned art experts to accompany the army. Napoleon’s commission to Jacques-Pierre Tinet named him “agent attached to the army of Italy charged with gathering, in the conquered lands, paintings, masterpieces and other monuments of antiquity that will be judged worthy to be sent to Paris” (Gould 1965, 45). The art requisitions in Italy differed from those in Belgium and the Rhine Cities in that they were generally formalized in the treaties imposed on the various Italian states. Subsequently, the French could claim that the flow of masterpieces from Italy to France was proper because the Italians had assented to it in legal documents. The haul from Italy was commensurate with the extent of the treasures to be harvested: immense. In early May, Bonaparte had requested a list of the paintings, sculptures and other collections to be found in Milan, Parma, Piacenza, Modena and Bologna. The armistice with the Duke of Parma (May 1796) required him to turn over 20 paintings, to be chosen by the French commanding general. The Duke of Modena was obligated to offer 20 paintings plus 70 manuscripts from the library. Bologna lost 31 paintings, 115 prints, 546 manuscripts and some Etruscan antiquities. The treaty with Venice (May 1797) stipulated 20 paintings and 500 manuscripts. In addition, the French carried away the four bronze horses of St. Mark’s cathedral and the lion of St. Mark’s square, though the treaty had made no mention of them. Milan, Verona, Perugia, Loreto, Pavia, Cento, Cremona, Pesaro, Fano and Massa all rendered to Napoleon his artistic tribute. By the treaty of Tolentino (February 1797), Pope Pius VI agreed to hand over 100 treasures from the Vatican, to be shipped immediately to France (Müntz 1895, 385-92; 1896, 481-502). One of the art commissioners in Italy, Thouin, wrote a letter urging that the treasures from the peninsula not be unloaded on the quai du Louvre like so many boxes of soap and proposing a triumphal procession. The ensuing celebration in July 1798 included a parade of art treasures—including the Apollo Belvedere, the Laocoön, Raphael’s Transfiguration, the Saint Jerome of Correggio, and paintings by Titan and Veronese—on 29 carts, accompanied by troops, dignitaries, a military band and wagons with caged bears, lions and camels. Preceding the carts was a banner whose inscription explicitly placed France alongside the great ancient civilizations: “La Grèce les cèda, Rome les a perdus; Leur sort changea deux fois, il ne changera plus” (Saunier 1902, 35, 37). The parade ended at the Champ-de-Mars and moved on the next day to the Louvre, which had become the preeminent collection of art in Europe (Gould 1965, 65; Lanzac de Laborie 1913, 236). In November 1802, the Louvre (soon to be renamed Musée Napoléon) received a new director, citizen Dominique Vivant Denon (Lanzac de Laboire 1913, 256-60). Denon had prior experience with art plunder, as part of a Scientific and Artistic Commission that accompanied Napoleon’s Expeditionary Force to Egypt (1798-99). Beginning with the German campaign of 1806, Denon accompanied Napoleon’s armies across Europe. He held unrestricted authority to select the best art works for the Musée and earned himself the nickname, l’emballeur (the packer; Treue 1961, 166.) After the battle of Jena, Denon hurried to Germany, urging Napoleon to demand from the King of Saxony, in the place of cash indemnities, a certain number of paintings from the renowned gallery of Dresden, especially some works by Correggio and Holbein. Napoleon, hoping to make an ally of Frederick-August, declined. Denon then headed for Cassel, where he took 299 paintings plus other art objects (Lanzac de Laboire 1913, 296). It was then on to Brunswick, whose duke had issued a 1792 manifesto against the French revolution and had commanded the enemies of Napoleon to Jena. In September 1806, Denon requisitioned from Brunswick 278 paintings and 250 drawings plus other art works, always carefully selecting the most outstanding pieces (Treue 1961, 170-71). From Schwerin, Denon lifted 209 items. In Berlon, he raked in 116 paintings and 204 statues, busts and reliefs, for which he provided a receipt (172). By 1809, the French armies had reached Vienna, where Denon personally supervised an inventory of the collections of the Belvedere. He selected 40 paintings for deportation to Paris, including 15 of the 36 Titans; the Belvedere lost 250 paintings in all (Treue 1961, 166-68). The French exacted their artistic toll also on Salzburg, Munich, Nuremberg, Düsseldorf, and Zweibrücken (Quynn 1945, 444). Spain also suffered major losses. The castles and Catholic orders in and around Madrid turned over 50 paintings, and other parts of Spain made similar sacrifices (Treue 1961, 174). At Denon’s urging, the Emperor Napoleon suggested that his brother Joseph, King of Spain, make a gift of Spanish paintings to the Musée Napoléon. In the event, Denon was disappointed with the paintings, complaining that only six could be hung in the museum. The French also punished Spanish nobles loyal to Ferdinand VII by confiscating their art collections; 250 of these paintings were eventually returned (Lanzac de Laborie 1913, 298-99). By 1810, pars of Italy had been incorporated into the Napoleonic kingdoms of Italy or Naples, and other parts had become départements of France. The latter category included Pisa, Siena, Genoa, Perugia, and Florence. The suppression of the monasteries in Italy, by a decree of September 13, 1810, produced the motive for Denon’s last collecting tour, which lasted five months in 1811 and 1812 (Lanzac de Laborie 1913, 301). He specialized in fifteenth-century Italian artists: Cimabue, Giotto, Fra Angelico, Lippo Lippi, di Credi, Ghirlandaio, Cima, Albertinelli. The major gaps were Masaccio and Botticelli, though not, in the latter case, for want of effort (Gould 1965, 112-14). These accounts of organized French art plunder in Europe do not take into account the private looting French officers and officials carried out, nor the activities of French dealers and merchants who were able to take advantage of distress sales and forced auctions, In any event, Napoleon largely succeeded in gathering to Paris many masterpieces of European art.